A black and white photograph of Ontario County Warden - Wilmot Bain. 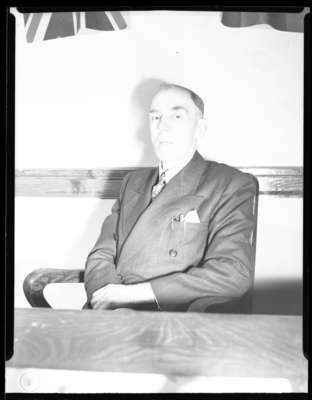 Wilmot Bain was Warden of Ontario County for 1948. It was an honour to be chosen as a warden. Wardens were elected by county council each year in January. The warden acted as chair of council meetings and spokesperson for the county. Wilmot Bain, 1948, Marjorie Ruddy. Whitby Archives A2013_040_1289.